Your prayers have been answered. It might only be on V6 models, but the 2016 Jaguar F-Type will be available with a manual gearbox. THANK YOU FOR SAVING THE MANUALS, JAGUAR. But hydraulic steering is now gone. Is it worth the trade? 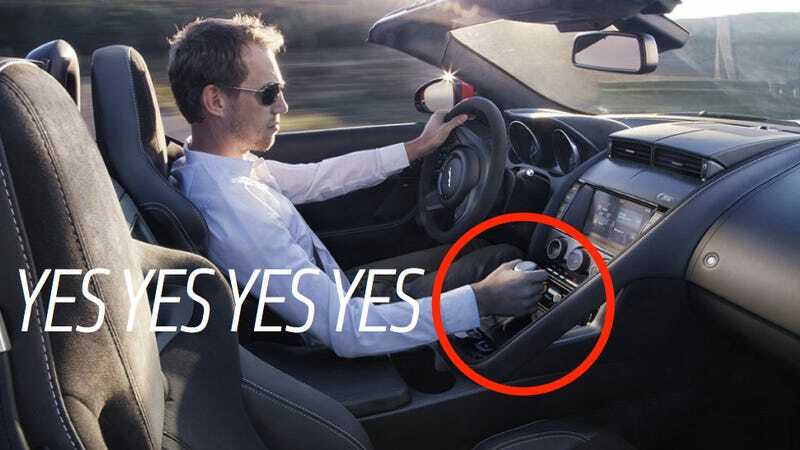 In a move that has been rumored for a very long time, Jaguar has finally confirmed that, along with the all-wheel drive F-Type, there will be a manual gearbox option, a ZF six-speed. Of course, it cannot handle the sheer power and torque of the monster V8 in the F-Type R (the V8S roadster has been replaced by the V8R roadster, which means that all V8 F-Types have 550 horsepower), but that doesn't matter, does it? The V6 F-Types, and yes, that includes the 380 horsepower V6S, are now available with a row your own gearbox. This is a big deal, especially when you look at the take rate for manual gearboxes across the board. Yes, the eight speed in the F-Type is currently magic, but a manual, well, that's involving and fun. Jaguar, you're ok in our book. This means that fans of old school Jags have an old school gearbox to shift in the old school style. This pleases everyone. Jaguar, you have earned major points today in one department, but might have lost points in another. The F-Type's hydraulic steering rack is gone for 2016. It might sound like a loss because the word "hydraulic" has suddenly become a synonym for "great," but the F-Type's steering has never been the standard of the world. Jag has been working on electric steering for years, and they think that they have it at a point where it's going to be great. Judging by where BMW and Porsche are with electric steering, I'd agree that the tech is ready for prime time. I'm not sad. Oddly, V8 engined cars now have standard all-wheel drive. The V6 cars with all-wheel drive are automatic only. The default torque split for the all wheel drive system is 100 percent to the rear, so shenanigans should still be on offer from the 550 horsepower V8. We'll see the cars in person later today at the LA Auto Show.